Tourists who complain about the fence put up around Stonehenge in the Seventies should spare a thought for their Neolithic ancestors... they couldn’t even see the site because of a huge wooden barrier. 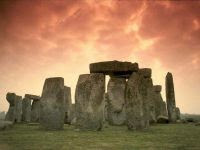 Archaeologists have found traces of the 20ft-high timber fence that snaked almost two miles across Salisbury Plain and hid sacred ceremonies from unworthy locals more than 5,000 years ago. ‘The most plausible explanation is that it was built at huge cost to the community to screen the environs of Stonehenge from view. Basically, we think it was to keep the lower classes from seeing what exactly their rulers and the priestly class were doing. This seems to be consistent with the idea that Stonehenge was used as an elite burial ground, and unlike the recent Stonehenge Decoded documentary, where the monument was presented more or less as a voluntary community building project/ritual space.